(Tucson, Arizona) — A week from Tuesday, on March 17th, millions of Israelis will go to the polls for one of the most consequential national elections of our times. We will be casting ballots for the political party of our choice, and in so doing choosing the makeup of the next Knesset (parliament) and our next Prime Minister. As I’ve been traveling across the U.S. in recent weeks on The Third Target book tour, people have been asking me whether Benjamin Netanyahu will return as Prime Minister, particularly in the wake of his impressive but controversial speech to Congress. The honest answer is: I have no idea. There is a groundswell of “Anybody But Bibi” voters. Some 30,000 Israelis turned out the other night for a rally in Tel Aviv calling for Netanyahu to be defeated and removed from office. Most of the Israeli media hates Netanyahu and are doing everything they can to disparage and discredit him. The left-wing parties in Israel can’t stand Bibi and are throwing all they can at him. Some on the center-right have policy disagreements and/or personal frustrations with him in his ninth year as Israel’s premier. And President Obama’s top operatives are in Israel working to unseat the PM. What’s more, most Israelis feel that Netanyahu was right to go to the U.S. to speak about the Iran nuclear threat, and most do not trust President Obama to cut a good deal with Iran that would keep Israel safe. 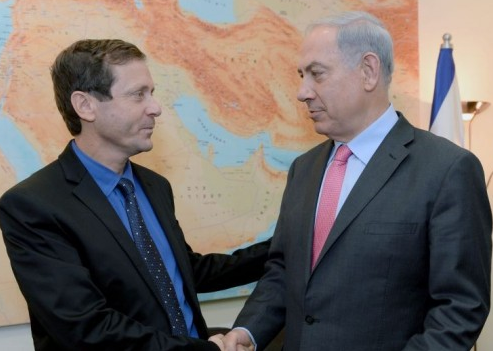 At the moment, most polls show a dead heat between Netanyahu’s Likud Party and the Zionist Union, though one outlier poll yesterday showed Netanyahu’s team ahead by five seats. It appears to be a jump ball between Netanyahu and Herzog. It could go either way. Thus, it is possible that Netanyahu could lose his position as PM this month, even as the showdown with Iran builds to a crescendo. I’m not predicting one way or the other, just trying to keep you up to speed. Here’s the latest average of 12 Israeli polls conducted by 8 leading polling companies, according to a widely respected Israeli political analyst. I will keep you posted as best I can in the days ahead.